Our experienced advisors take the time to match a tutor to your child's personality and difficulties. Thanks to its network of specialized tutors, School Success can help you find the best person to meet your child's needs, whether they are in elementary school, high school, or cegep. 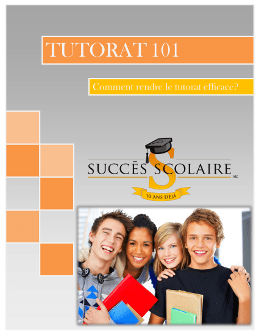 Tutors on the South Shore offer services online, at the learning center in Longueuil or at home. Through individual support, the tutor ensures that they are taking a unique approach tailored to your child in order to address concepts seen in class, consolidate what they've learned, prevent them from falling behind or help them catch up, provide further advancement, and suggest efficient work methods and learning strategies. Before becoming part of the School Success team, all our candidates must undergo a rigorous certification process during which their competencies are tested and their criminal record is verified. All tutors have experience with children as well as a university degree related to the subjects they teach.